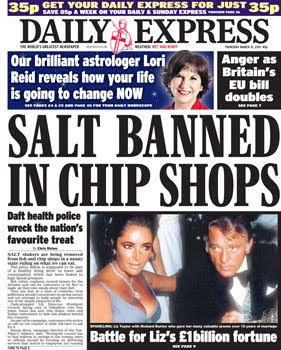 Salt shakers are being removed from fish and chip shops in a nanny state ruling on what we can eat. The petty diktat is supposed to be part of a healthy living drive to lower salt consumption which has been linked to high blood pressure. The story includes a large number of 'angry' quotes from local residents, rent-a-quote politicians and, inevitably, the TaxPayers' Alliance. So for Stockport Council to force food outlets to withdraw salt from view is daft. Any council official turning up at a fish and chip shop to check the ban is being enforced rigorously may run the risk of getting battered. Stockport Council...wants fish and chip shops, cafes and Indian restaurants to hide salt shakers behind the counters. As part of its campaign, customers who notice no salt on the counter or table will have to ask for it. The move is part of the wider Greater Manchester ASK campaign to cut excessive salt consumption, which is linked to high blood pressure, stomach cancer and asthma. Businesses that sign up to the scheme will display an ASK symbol in their windows and have information on their cafe tables. And yes, that really is 'out of site' (thanks geeoharee). one of the simple pleasures of life. Every year 17,500 people die in the UK from cardiovascular disease and strokes caused by eating too much salt. There have been some eye-catching headlines in the papers over the last week. Somehow, there have been seven articles (so far...) in the nationals about this nonsense, each one including a video which claims to be evidence of the 'poltergeist' moving a chair. It's not. The Sun ran a story under the 'Staff Reporter' byline on 28 March and then a follow-up by Gary O'Shea the next day. Today, O'Shea reported that Derek Acorah had 'banished' the poltergeist, who was called Jim. The Mail has, as usual, been quick to, ahem, 'borrow' these stories from the Sun and run their own not-very-sceptical versions of them. The Mirror and Telegraph have also covered it. Dr Sarah Knox, who led the research...stressed that the study had not shown that higher PFCs actually cause earlier menopause. The researchers only looked at whether women had gone through menopause, and they categorised these women into one of three different age brackets they belonged to at the time of the survey. As such, the study cannot tell us how old the women were when they reached menopause and whether those who had early menopause (i.e. before the age of 40 or 45) were associated with higher PFC levels. In February, the Mail, Telegraph, Richard Littlejohn and others claimed that Suffolk Police were happily displaying the rainbow flag for LGBT History Month but were totally 'forbidden' from ever flying the Union Flag. There was, as usual, no such ban on the Union Flag. It was completely untrue, and had any of the 'journalists' actually bothered to contact the police, they would have been told that. The Press Complaints Commission received two complaints about the Mail's article. The PCC took the view that these were third-party complaints and so would not 'examine' them under the terms of the Code. But they had gone to the trouble of asking Suffolk Police if they wanted to pursue a complaint, but the constabulary decided against it. The complainants were concerned that the claim the Union Flag had been banned by the Chief Constable of Suffolk was inaccurate. A spokesperson for the police had confirmed on Anglia TV that this was not correct and that both the rainbow flag and Union Flag were flown outside the police headquarters. The Commission fully acknowledged the concerns raised by the complainants in regard to the accuracy of the article. However, the Commission generally only considers complaints from those directly affected by the matters about which they complained. In this instance, the article related directly to the Suffolk Constabulary and as such, the Commission would require its involvement in order to come to a view on the matter. It had therefore proactively contacted the police force, which had been aware of the article but had decided not to make a formal complaint about it. While it emphasised that the concerns of the complainants were indeed legitimate, it did not consider in the absence of the participation of the police that it was in a position to investigate the matter, not least because it would not be possible to release any information about the outcome of the investigation or resolve the matter without the input of the Suffolk Constabulary. That said, it recognised that the complainants had provided information which had a bearing on the accuracy of the claim made in the article and, as such, it requested that the newspaper would take heed of the points raised in the complaints and alter the article accordingly. In light of the police’s decision not to pursue a complaint against the newspaper, the Commission could not comment on the matter further. requested that the newspaper would take heed of the points raised in the complaints and alter the article accordingly. Given that the PCC said they were not going to deal with the complaint formally, that is, perhaps, more than they might have done. But as yet, the Mail have not taken heed of this request. Hopefully they will - although there appears to be no sanction for ignoring it. And would an 'alteration' (which would be difficult, given the whole article is about the Union Flag 'ban') to the story, done without fanfare, matter two months later anyway? UPDATE: The Mail have done more than 'alter' the original article - they've removed it completely. They've also edited Littlejohn's column to remove his reference to the ban. Yet in neither case have they explained why - there appears to be no clarification or apology. This way, they can just pretend they never said it in the first place. Following last year’s triumphant forecast of a ‘barbecue summer’, the Met Office is now predicting a ‘phew-what-a-scorcher’ August this year. So expect a small tsunami. Better start stocking up on umbrellas, dinghies and galoshes, just in case. This short piece seems to have been thrown in at the last minute, as several newspapers reported on a long-range weather forecast yesterday. Unfortunately for Littlejohn, that forecast came from Positive Weather Solutions (PWS). Not the Met Office. Oh, and the Met Office's infamous 'barbecue summer' forecast wasn't 'last year' but in 2009. So that's two factual errors in one sentence. We have therefore decided to stop issuing a UK 'seasonal forecast' four times a year. Instead, we will now publish a monthly outlook, updated on a weekly basis. If he missed their press release, he could have read the news in the paper he writes for. Whilst the Daily Star also followed the path of the Daily Telegraph, the only two newspapers which seemed to have the balance correct, and indeed the quotes correct, were the Daily Express and the Daily Mail, who quite rightly went along the lines of a mixed June and July, with August possibly [their emphasis] offering the best of the weather. If you can see the word 'barbeque' in our August forecast, please let us know. No one with a shred of humanity can fail to be moved by some of the pictures coming out of Japan, whether an elderly woman being rescued from the rubble or frightened, bewildered schoolchildren waiting in vain for parents who will never return. The devastation is on a biblical scale. Comparisons have been drawn with the dropping of the atom bombs on Hiroshima and Nagasaki. Despite filling our homes with Japanese electronics and our garages with cars made by Nissan and Toyota, despite the vivid images on TV and assorted social networks, it remains a faraway country of which we know little and understand less. Of course, when Top Gear got into trouble recently for calling Mexicans 'lazy, feckless and flatulent' the Mail called this a 'slur' and an 'insult' and churned out six (very similar) articles about it within five days. And the Mail leapt on another 'diplomatic incident' caused by a BBC programme, when QI made some jokes about a man who had survived the atmoic bombs dropped on Hiroshima and Nagasaki in 1945. The programme had caused a 'furore', 'insulted' one man and been 'Quite Insensitive'. So, if the BBC makes jokes about all Mexicans or one Japanese man, it's an 'insult'. If a Mail columnist says with a straight face that the 'Japanese people' - presumably all 125 million of them - are 'militantly racist', then that's, apparently, acceptable. To the Mail, it's 'powerful and provocative'. would never have joined a minute’s silence for Japan...Were he alive today, he would have remained doggedly in his seat if requested to stand in silent tribute to the dead of Japan. Which may or may not be true - since he's dead, we'll never know. Yet when some people remain seated when asked to stand in tribute to one person who is alive, the Mail gets angry. I often wonder what our fathers and grandfathers would have made of modern Britain’s ghastly cult of sentimentality and vicarious grief. Ever since the hysteria surrounding the death of Lady Di, when half of the nation seemed to take leave of its senses, a section of the population seizes any excuse for a sobfest. Showing ‘respect’ has become institutionalised. Before every one of the weekend’s Premier League football matches, for instance, fans were forced to stand and observe a minute’s silence for Japan. Why? Why? Because over 9,000 human beings were killed and over 13,000 are missing, perhaps? But to him, a minute's silence for those people is 'any excuse for a sobfest' and part of a 'ghastly cult of sentimentality'? 'Showing ‘respect’ has become institutionalised.' How awful. And 'forced'? More likely they were asked to, and thought it an appropriate thing to do. I have no objection to honouring the dead in public, if the occasion or sense of loss warrants it. At White Hart Lane we’ve recently said goodbye to some of the stars of Spurs’ double-winning side from the Sixties. There was genuine sadness over the loss of men many in the crowd had known personally. But how many of the hundreds of thousands of supporters corralled into grieving for Japan could even point to that country on a map? So silent tribute to a few footballers is 'warranted'. But for tens of thousands of victims of a natural disaster? ...an excuse for a self-indulgent display of cost-free compassion. He really doesn't seem to be able to grasp that people might feel 'genuine sadness' over the deaths of those we may not know personally. Like most monsters, the Premier League has a sickening streak of sentimentality. Barely a week passes without yet another minute’s silence before kick-off...Of course, there is a commercial incentive here for the Premier League. No doubt the Japanese TV rights are up for renegotiation soon. But there were silences before last weekend's Six Nations rugby games. And before football games elsewhere so this isn't just a Premier League, or even just a British, thing. But why Japan and not, say, those massacred in Rwanda or starved to death by Mugabe in Zimbabwe? I don’t remember a minute’s silence for Haiti, although I may be mistaken. I’m sure we didn’t have a minute’s silence for our earthquake-hit Commonwealth cousins in Christchurch, New Zealand, before the Milan game. Maybe we did. But look at the rest of that paragraph. 'I'm sure we didn't...Maybe we did'. It really is quality journalism, isn't it? A very quick use of Google would have proved there were minute silences for the victims of both the Haiti and New Zealand earthquakes in various places. He may be right about the Milan game, but there were silences at other sporting events for New Zealand, including at the Six Nations rugby, the cricket World Cup and at football matches. Of course, had he bothered to find out about those silences, his argument of 'why a silence for the militant racists and not our Commonwealth cousins?' would have fallen apart. Do you think the Japanese held a silent tribute for the victims of the London Transport bombings in 2005? Me neither. I would also like to extend my deepest sympathy to the victims of the attacks. At around noon on July 8 on behalf of Prime Minister Koizumi currently visiting the United Kingdom, Chief Cabinet Secretary Hosoda visited the British Embassy in Tokyo to express the sympathy of the Government of Japan for those who were sacrificed in a series of explosions in London. At the Embassy Mr. Hosoda expressed the deep condolences of the Government of Japan to the Government of the U.K.
Japan has pledged more than $1.5 million in private donations. The government of Japan has donated $200,000 in cash to the American Red Cross and some $800,000 in relief supplies -- from blankets to generators -- already are arriving to aid the most needy. That's those 'militantly racist' 'alien values' in action. It is wrong to visit the sins of previous generations on their modern descendants, although that doesn’t prevent the British Left constantly trying to make us feel guilty for centuries-old grievances, from the slave trade to the Irish potato famine. And yet here he is, faced with the 'biblical-scale' devastation of the recent tsunami, dragging up decades-old grievances about the actions of some Japanese people. If he thinks it's wrong the visit the sins of previous generations, why mention the war at all? The latest issue of SF Weekly - a publication based in San Francisco - has a cover story about how 'illegal immigrants find that being a crime victim is their best ticket to citizenship' thanks to something called the 'U-visa'. That article, written by Lauren Smiley, was published on 16 March. Four days later, the Daily Mail ran an article headlined 'The 'crime visa': How 18,000 illegal immigrants got legal status by being the victim of a crime' which was 'written' by their Daily Mail Reporter. This was actually our cover article on U visas, shamelessly ripped off and plastered on the website of the wildly successful British tabloid newspaper the Daily Mail. This is an example of "churnalism" at its most depraved -- the story's byline reads only "Daily Mail Reporter," as if the anonymous hack couldn't bear to fess up to his or her lack of originality. The article proceeds to rephrase our sentences, lift our quotes verbatim, and even write snappy sidebars about the visa-seeking San Francisco-based immigrants -- Rosa Aguilar and Adolfo Lopez, you've gone international! -- profiled in our original story. Check out our story versus theirs for yourself: There is absolutely no original reporting in the entire Daily Mail piece. Apparently the reporter thought he or she was absolved via a quick "SFWeekly.com reports" in the 18th paragraph. No link or anything. Wow, thanks. C'mon, guys: All we're asking for is some link love and heavy attribution high up in the story. Then go ahead and take what you want. To borrow a British expression, what the Mail did -- it's just not cricket. This article has been amended. It previously contained a graphic that correctly listed the latest annual number of non-EU nationals admitted to each of ten European countries. However, a second table was wrongly headed "Non EU citizens to each square kilometre" instead of "Number of people to each square kilometre". We are happy to correct this point. The complainant was concerned that as a result of the error readers would be misled into thinking that Britain was home to many more non-EU immigrants than was actually the case. 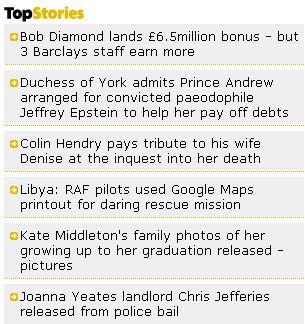 Going by the date-stamps of the comments on each article, it appears the Sun was first with this 'news' and the others mindlessly followed. Each article served up the same scant 'facts', a few blurry stills and an embedded video of the incident. ...surgically enhanced Israeli model Orit Fox got more than she bargained for when the massive boa constrictor took objection to her over familiarity and reacted by biting into her breast. It all sounds very unlikely - even if you accept a snake can die of silicone poisoning, you would think it would have needed to pierce the implant, which would surely have resulted in more extensive medical treatment for the woman than a 'tetanus shot'. “Really? Poor snake,” lamented a reader; “lmao I was joking!,” replied the article’s author. So a joke made on a celebrity gossip website becomes accepted as true, without any basic fact-checking, by three British newspapers and their websites and then run as news 11 days later. In fact, the Daily Week shows, it spread more widely than that, appearing in the New York Daily News, Huffington Post (with hat-tip to The Sun), Best Week Ever and many other places. Update: The Daily What reports that the snake actually made it out alive! That means it's Model: 0, Snake: 0. UPDATE/CORRECTION: It turns out the snake didn’t die. The Daily Mail and the Daily News picked up a joke from ONTD as part of the story by accident. The rest is still accurate. Sorry, guys. Congratulations, snake. And thanks to Rich Juzwiak’s comprehensive Tweet for clearing that up. But so far there have been no amendments to the 'stories' published by the Sun, Mail and Metro. The Northern Health and Social Care Trust complained to the Press Complaints Commission that the newspaper had published an article which inaccurately reported that two people had been admitted and treated in Causeway Hospital following carbon monoxide poisoning. On 11 August last under the headline "2 more poisoned", we reported that two women were admitted to and treated overnight at the Causeway Hospital in Coleraine shortly after a public safety warning had been issued concerning carbon monoxide poisoning following the suspected faulty installation of gas appliances. At that time the hospital stated that it had no record of two women being admitted or treated in the hospital and we accept this. The two women concerned said they had attended the A&E department because they had symptoms consistent with exposure to carbon monoxide gas and had been advised to seek urgent medical attention. We have since been made aware that although the women were concerned they may have had CO poisoning, in fact, they did not. On 16th December 2010 we published an article on our front page and pages 4 and 5, making a suggestion that immediately after Amir Khan’s successful WBA world champion fight against Marcos Maidana in Las Vegas on 11th December 2010, Amir Kahn was joined by Katie Price for dinner and subsequently in his suite. At that point, Katie Price had not become estranged from her husband Alex Reid. In fact, Amir Khan did not meet with Katie Price whilst in Las Vegas and has never, as alleged, sent indecent photographs of himself to Katie Price. We apologise to Amir Khan for any distress or embarrassment our story may have caused. Perhaps the Mail's website could shed some light on that? For example, on the website today: Britney Spears looks in 'great shape' showing off her 'fantastic form'. But on the Mail's website in January: Britney Spears looks 'bloated and unkempt'. On the Mail's website today: Megan Fox 'cuts a glamorous figure' as she 'saunters around in a low cut dress'. On the Mail's website last week: Megan Fox looks 'gaunt and skeletal' and 'too skinny'. On the Mail's website last month: Megan Fox 'could wear a paper bag and look good in it thanks to her enviable physique'. On the Mail's website in the past: Leona Lewis might be 'dumpy' or might have 'killer curves'. Katy Perry might have 'girth' or a 'voluptuous figure'. A 'curvaceous' woman dares to eat dessert. A woman weighing 9st is ridiculed for her 'blubber'. There are hundreds of such nasty, pointless articles on the Mail website, which criticise famous people - but particularly famous women - who dare go out in casual clothes, or without make-up or without looking exactly how the mean-spirited hacks on the Mail website demand they look at all times. It was in October 2009 when a story appeared claiming that an 'illegal immigrant' had been saved from deportation because he had a cat. It started in the Sunday Telegraph, and was then repeated by the Mail, Sun, Express and Star, and in columns by Littlejohn, Platell, Holmes and others. Despite the man's lawyer being quoted in the original article (and explaining on this blog) that the cat was 'immaterial' to the case, the story went on and on. And 17 months later, the Star reader's text shows some people still believe it did actually happen. 'Shameful...finger pointing and character assassination'. 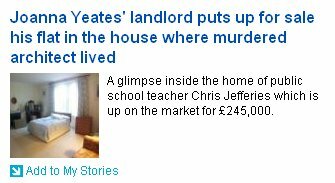 That was the reaction of Jo Yeates' boyfriend to media coverage of the arrest of her landlord Chris Jefferies. Both Enemies of Reason and Minority Thought covered the dreadful, intrusive, guilty-because-we've-decided-he-is 'reporting' at the time. The Mail called Jefferies 'Mr Strange', 'the 'nutty professor' and 'Professor Strange'. He 'idolised a poet obsessed by death', they claimed. One front page splash carrying a large picture of Jefferies asked 'Was Jo's body hidden next to her flat? '; another wondered if he held 'the key to Joanna's murder'. The Mirror called him a 'peeping tom'. Police have now confirmed he was discharged from his bail conditions on Friday night. Will this info be any more prominent in tomorrow's print edition? In our 5 November 2010 article “Burkha ‘no more a threat than a nun’s habit’ says Cherie” we reported that Cherie Blair had, in a speech to Muslim women, defended the wearing of the Burkha and that this was a change from her previously stated opposition to the Burkha and to full-face veils. In fact, Mrs Blair spoke in support of Muslim women’s right to wear their traditional hair cover which leaves the face uncovered. We accept that Mrs Blair made no comment about the Burkha and her views on face coverings had not changed. We apologise to Mrs Blair for this error and any confusion caused. Two national newspapers were today found guilty of contempt of court over the use of internet photographs. In what are believed to be the first cases of their kind, the High Court in London ruled the contempt occurred when the Daily Mail and The Sun websites carried pictures on their websites of a murder trial defendant "posing with a gun". Judge Michael Murphy QC, who presided at the trial, refused to discharge the jury after saying he was "quite satisfied" no members of the jury had been influenced by the internet. Lord Justice Moses and Mr Justice Owen said that - "notwithstanding that publication of the image of the accused with a pistol was a mistake" - there was a breach of the contempt laws under the strict liability rule. "We conclude that the nature of the photograph created a substantial risk of prejudicing any juror who saw that photograph against the defendant Ward." Lord Justice Moses, giving judgment on behalf of the court, said: "The criminal courts have been troubled by the dangers to the integrity and fairness of a criminal trial, where juries can obtain such easy access to the internet and to other forms of instant communication. "Once information is published on the internet, it is difficult if not impossible completely to remove it. "The courts, while trusting a jury to obey a prohibition on consulting the internet, have been concerned to meet the problem. "This case demonstrates the need to recognise that instant news requires instant and effective protection for the integrity of a criminal trial." The judges will consider what penalties and costs orders to impose on Associated Newspapers, publishers of the Daily Mail, and News Group Newspapers, publishers of The Sun, at a future date. The Advertising Standards Authority has upheld one complaint against the Daily Express, and three complaints (regarding one ad) against the Sunday Express. Both cases involve front page splashes about a free giveaway of toys and games where there was insufficient stock to satisfy demand. We noted there appeared to have been a lack of communication between the Express, Mattel and ELC resulting in the promotion going ahead when there was insufficient time or stock to satisfy demand. We understood that participants were told about the delay, but nonetheless considered that, because the toy was not available to collect as claimed, the promotion was misleading. We considered that the Sunday Express and Argos had not demonstrated that they had made a reasonable estimate of demand for the board game and, moreover, had encouraged readers to purchase the Sunday Express as a precondition to obtaining the board game when the number of items was limited. We concluded that the promotion breached the code. The ASA has ruled neither promotion should run again in its current form, but since these were one-off giveaways, they probably weren't going to be repeated anyway. And there's no penalty other than a written ruling that few people will ever see. So while Richard Desmond may have removed his newspapers from the jurisdiction of the Press Complaints Commission, we can be sure the ASA will still be holding them rigorously to account. Ahem.